Yes, there is a cute makeup fridge, also known as a beauty, cosmetic or skincare fridge that is meant to store all the skincare products that keep your skin looking fresh and rejuvenated, reports British Vogue. So, if your beauty products are fighting with your Sunday leftovers for shelf space in your refrigerator, it might be time to invest in a cosmetic fridge. What is a mini beauty fridge? YouTuber Safiya Nygaard got Twitter users talking when she posted her new cow print skincare fridge over the weekend. “I just bought a skincare fridge, have I gone too far?” she asked. Many Twitter users were only learning about the existence of the mini beauty fridge for the first time and had mixed reactions. "There's a skincare fridge?" asked one Twitter user. While another laughed, writing: "Well, I guess I keep learning new things." 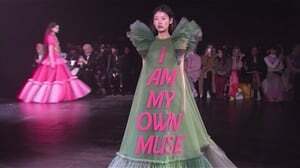 So, what is it exactly? A skincare or beauty fridge is an adorable, mini version of the kitchen appliance — but it’s only meant for storing your beauty products. The refrigerator is compact, comes in a range of colours, and keeps beauty goodies in the 46- to 50-degree range according the Amazon page. It will cost you between $40 (R560) to $80 (R1 100). The fridge runs silently and uses about as much power as a 50-watt light bulb. It turns out, quite a number of people have been living the beauty fridge life, and editor of Allure Michelle Lee is one of them. READ MORE: Could refrigerated skincare add bling to your skin? She shared a series of Instagram photos displaying her skin-care fridge stacked with beauty products, revealing on Instagram that she has been using cold face mists to soothe her skin after having a fraxel laser treatment. 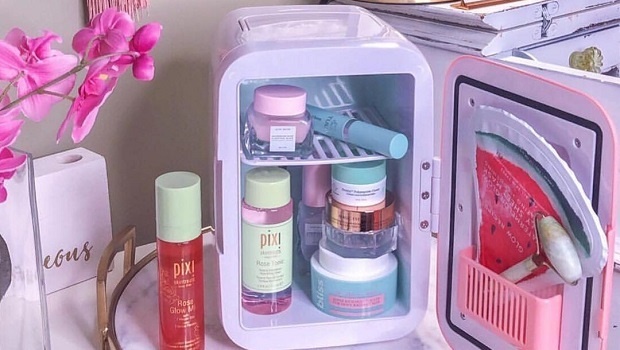 Surprisingly, the enviable mini refrigerators have been a staple among skin-care enthusiasts in Korea for a few years now, but are only just gaining popularity in the US, according to Refinery. From Instagram posts, we have seen a variety of products, from nail polishes, lipsticks, sheet masks, day creams, jade rollers and face mists. However according to Vogue, vitamin C, retinol, benzoyl peroxide, DHA, and anything preservative-free should be kept in the fridge. By doing so, you’ll make sure that they don’t lose their potency or develop bacterial growth. Why not keep your skincare products in your regular fridge, you might ask? You can. That won’t be an Instagrammable picture though. But if you don’t mind the possibility of your beauty products vaguely smelling like food, then you can definitely continue using your regular fridge. "I just put my products in the kitchen fridge in the salad drawer," commented one Twitter user. If you feel like it might be a bit extra to add a mini-fridge to your self-care routine, think again. People are proudly sharing their personal fridges and we think we're sold. Could refrigerated skincare add bling to your skin?